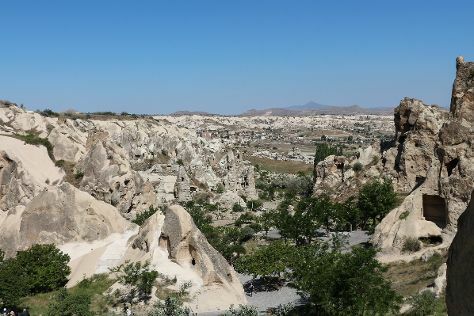 Enjoy the best views of Capaddocia at Uchisar, home to a rock citadel at the area's highest point. Kick off your visit on the 24th (Thu): explore the striking landscape of Goreme National Park. Get ready for a full day of sightseeing on the 25th (Fri): get interesting insight from Tours and then look for gifts at Alaturca Taner. To see more things to do, ratings, where to stay, and more tourist information, you can read our Uchisar route maker tool . Rio de Janeiro, Brazil to Uchisar is an approximately 21.5-hour flight. The time zone difference moving from Brasilia Time (BRT) to Eastern European Time (EET) is 6 hours. Plan for colder temperatures traveling from Rio de Janeiro in January, with highs in Uchisar at 5°C and lows at -4°C. Finish your sightseeing early on the 25th (Fri) so you can travel to Istanbul. Head to Kapali Carsi and Istiklal Streetfor plenty of shopping. Next up on the itinerary: wander the streets of Ortakoy, appreciate the extensive heritage of Sultanahmet District, contemplate in the serene atmosphere at Sultan Ahmed Mosque, and head outdoors with Silivri Sahili. For maps, more things to do, reviews, and other tourist information, you can read our Istanbul trip itinerary planner . Getting from Uchisar to Istanbul by combination of taxi and flight takes about 4 hours. Other options: do a combination of taxi, flight, and shuttle; or drive. Expect a bit warmer weather when traveling from Uchisar in January: highs in Istanbul hover around 10°C, while lows dip to 10°C. Cap off your sightseeing on the 29th (Tue) early enough to travel back home.